Scene of the world’s most famous narrative, the Holy Land is an eternal source of fascination, curiosity and awe. This land, known as the Fertile Crescent, stretching from Egypt and Israel to Syria and Mesopotamia (today’s Iraq), gave birth to three great faiths — Judaism, Christianity and Islam. Acclaimed author Dr. Jean-Pierre Isbouts skillfully employs a wide range of sources, drawing from ancient Mesopotamian and Egyptian texts, biblical literature and the latest findings in archaeology, paleo-anthropology and forensics. From the dawn of human civilization to the seventh century, the book tracks the evolution of Judaism, the emergence and development of Christianity and the rise of Islam. 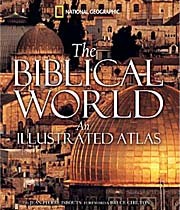 Biblical people, sacred places and epic events, placed in the context of history, are brought to life in a stunning panorama, gloriously illustrated with hundreds of exquisite photographs and 50 all-new maps created by National Geographic’s world-class cartographers. A panel of experts, including Dr. Bruce Chilton, who wrote the foreword, Dr. Eric Cline, Dr. Jacob Neusner and Dr. Frank Peters, consulted on the text. The book contains numerous sidebars and fact boxes describing everyday life in each biblical period and more than 60 timelines that link events across cultures and regions, compare religions and follow developments in nearby lands. For its scope, beauty and relevance in today’s world, the atlas is destined to become a classic.